IT WOULD BE EASY to think of The Cigardian as a solution without a problem. You, because you smoke, already have a clip of some kind, or a notch cut in the leather of your bag, or something to hold your burning cigar … while you go putt, just long enough for the flame to go out. You, because you play, already have a greens repair tool … but it doesn’t keep your grip dry when you set your putter down to chip … and it doesn’t have a slot to slip your cigar into so it stays burning and nearby. Maybe you don’t need The Cigardian. But what does need have to do with it? You, a personage of golf in our time, deserve this tool of substance and style and utility. Neil Goldoffas, 62, of Cleveland, once upon a golf round, decided there was a better way than laying his ‘gar in the grass. It got him to thinking: “If you cantilever something, that could work.” Nobody but Neil knows what that means. For his prototype, Goldoffas cut up a scorecard. Now, his Cigardian is machined from solid brass. The hole in the middle accommodates up to a 52-ring-gauge cigar. The u-notch on top keeps your grip off the slop. 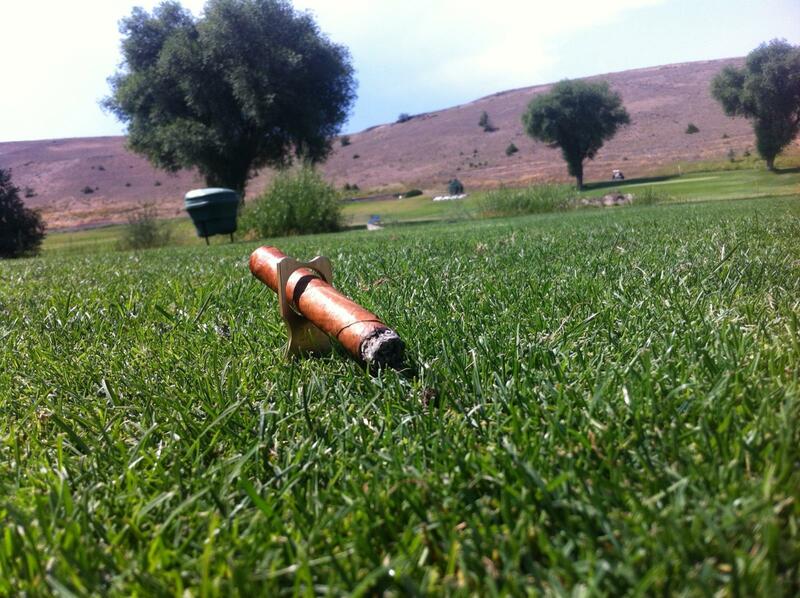 Personal testimonial: The Cigardian is sturdy, feels good in your hand, and the three prongs of the repair-tool end make quick work of any ball mark on the green. The monogram on the model he sent me is a nice touch. The Goldoffas tool was marketed first through Famous Smoke Shop; later, he had to buy the Cigardian trademark from a guy making humidors out of soaked cedar. Nowadays, you can pick up a Cigardian at TheCigardian.com, where it is suggested that you, in fact, need one in your pocket. Need’s got nothing to do with it. You deserve one.